Avocados aren’t only tasty—they’re good for you too! They’re jam-packed with healthy fats, valuable nutrients and vitamins (like vitamin K, vitamin C and potassium), fiber, and antioxidants. Additionally, they don’t contain any sodium or cholesterol. If you want to increase your overall avocado intake, try our recipe for a California Cobb dip. Our recipe calls for three ripe avocados, tomatoes, lettuce, and grape tomatoes, making it by far one of the most healthy and nutritious dips we’ve come up with. After trying the recipe, please share it with your friends and family on Facebook, Pinterest and Twitter. A good Cobb dip recipe can be very satisfying. Cobb dips are pretty healthy, but they’re also rich in flavor too—the avocado, onions, lemon juice, and bacon come together to make a dish that’s savory and satisfying. 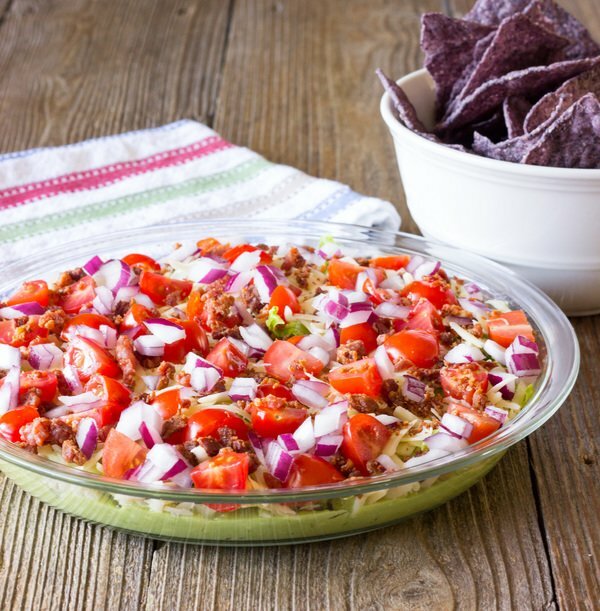 If you’re interested in making the recipe, you’ll need three ripe avocados, at least two tablespoons of lemon juice, Romaine lettuce, Cabot Sharp Cheddar, grape tomatoes, cooked bacon (or you can buy the pre-crumbled bacon), and red onion. Once you’re ready to make the dish, mash up the avocados and transfer the mixture to a pie plate, spreading everything across the bottom. Top it off with the cheese, onion, bacon, and tomatoes. Then store the dip in the fridge until you’d like to serve it. We recommend chips, crackers, veggies or slices of toasted baguette for dipping. Avocado works great with dips, but you can pair it with other food items too. For instance, our tortilla crisps recipe features fresh tuna paired with a yummy avocado spread. You can’t beat that! Cabot is a cooperative of 800 farm families. We work hard year-round to produce our award-winning cheeses and dairy products. We hope you love our recipe for Cobb dip. If you have any thoughts or suggestions on ways to improve the dish (or if you’d just like to let us know how much you liked it), please rate and review the recipe! PLACE avocados in a medium bowl and mash with fork or potato masher until mostly smooth. Add the lemon juice and garlic salt to the avocado. Stir until well combined. Transfer the avocado to a 9 inch pie plate. Spread it into an even layer. TOP avocado with layers of lettuce, cheese, tomatoes, bacon, and onion. COVER pie plate with plastic wrap and store it in the refrigerator until ready to serve. Serve with optional dippers like tortilla chips, crackers, or sliced and toasted baguette. *Cook time based on buying packaged cooked bacon crumbles. Recipe and photo courtesy of The Wholesome Dish. Love this recipe for summertime entertaining, delicious and refreshing!